It’s not just another cozy office job where you sit around for 8 hours, get a paycheck and call it a day. In fact, it’s a more entrepreneurial job than most – it’s a work hard, non-stop, always-on type of job. You have to constantly think outside the box on how to find, attract and convert the right candidates. Well, our handpicked arsenal of productivity tools below will help you do just that! We scoured the internet to find the very best free (trial) tools, that allow you to get twice the work down with half the effort. E-mail tools, writing tools, task management and anti-distraction tools – it’s all here. You can use the Table of Contents below to jump to whatever it is you’re interested. If not, read on for our full curated list of the 11 best productivity tools for recruiters of the moment. The first step in every candidate search is posting the job ad. And, while job boards are fine, the tools in this section can be a secret weapon in your arsenal. Monster, Indeed, Linkedin, there are so many job boards to post on but so little time. While you have just one job description to post, you still have to go through all the relevant job boards and submit them manually. BetterTeam simplifies this process for you. All you have to do is create one and pick the job boards you’d want it to appear on. Yep, it’s that simple. And to put icing on the cake, BetterTeam also helps out with writing the job ad, if that’s not your strong suit. A big chunk of your job as a recruiter is head-hunting. You’ll have to manually search for potential candidate LinkedIn profiles, which on its own, can be very time-consuming. Spending weeks on finding one hire for a single company can make it hard to hit your targets. What you could do instead is let Aevy take the job off your hands. The software detects what your needs for the candidate are through a quiz & searches its database for anyone that might be relevant. And you know what’s the best part? You only pay in case there’s a successful hire. Everyone gets distracted once in a while. A stray Facebook notification can be very enticing to click on, taking you into a rabbit hole of distractions. For some positions, this isn’t too much of a threat if you’ve done the work. There aren’t any hard deadlines in sight, so you can afford to get distracted here and there. As a recruiter, though, you’ll probably feel a hit. After all, your work is highly performance based. By using the right time or distraction management tool, you’ll be doing the most work you can. If you haven’t heard of the Pomodoro Technique, you’re definitely missing out. It’s a time management methodology developed in the 1980s by Francesco Cirillo. The technique dictates that to be most productive, you need to work for intervals of 25 minutes & take a 5-minute break between each interval (measured through a timer, of course). The TomatoTimer is a nifty online tool that does the timing for you, which is a lot simpler than just using your phone – because on your phone, said distractions are but one click away. The TomatoTimer, sadly, isn’t a cure-all for any distraction. Sometimes, the temptation will take over, you’ll pause your timer, and enjoy some quality time with your favorite subreddit. And as we’ve already established, the more time wasted, the fewer your output. SelfControl blocks out all of your favorite websites, allowing you to focus on work that really matters. You input the list of websites you’d like to block & it does its job. SelfControl is iOS only, so if you’re looking for a windows alternative, you can check out FocusMe. it’s a highly effective productivity app. As a recruiter, you probably have a lot of to-dos all over the place. Schedule that call, email that follow-up, attend the meeting, etc. Unless you’re super diligent with your to-dos, you might end up missing some very important tasks – and this can be pretty damaging. Are you a bit late with the follow-up email? The candidate accepts a different offer. Did you miss a meeting? The next available time slot is within 3 weeks. These tools put all of your to-dos in one place, making sure that you never miss a deadline. You’ve probably used a Kanban board before – you’ll find it’s present in almost every office. Trello is your personal digital Kanban board, where you can divide tasks based on your preferences. You could do the traditional “To-do, In Progress, Done,” or even turn it into your very own pipeline for leads: “To-Contact, Emailed, Interview, Hire.” As a given, you can set deadlines for the tasks, as well as share it with your coworkers for collaboration. Trello is basically your digital Kanban board – but that’s awesome enough! In Jeff Hayden’s ‘Motivation Myth’, Jeff describes how checking off tasks releases a tiny bit of dopamine in the brain, giving you the motivation to check off the next. Todoist is your all-in-one to-do list dashboard. At the beginning of each day, you get the complete list of to-dos you’re supposed to work on. You prioritize them based on deadline or importance and check them off throughout the workday. Todoist is your digital checklist. Email is the most common tool used by recruiters today. If you’re doing headhunting, you might even end up sending hundreds of emails on a daily basis. Depending on how good your email game is, this might make or break your career as a recruiter. The following tools help you master cold email outreach, whether it’s by helping find people’s emails or helping optimize your writing. With email, you can never really know how it’s going to be received. In fact, something as minor as what time the email is sent can affect how the candidate reacts to it. As a recruiter, it’s part of your day job to send out emails. The candidate, though, is working during your day job – and the last thing they want to see while working on an important project is a stray email. Boomerang allows you to schedule your emails based on when you’d want to send them, giving you the power to reach the right candidate at the right time. It also offers several additional features to boot, such as reminding you to follow up on a certain conversation. Boomerang helps you schedule emails to improve conversion rate. Finding the right email is a pain known all too well for any headhunter. You might spend hours and hours crawling the web, trying to get a contact for a lead. Worst case scenario, you might not even find the email, making the search all for naught. With Hunter.io, all you have to do is input the name of the company a candidate is working for, and voila! You get a list of emails within the company. While emailing someone’s work email is not as effective as personal email, it’s significantly easier to find. If you combine this with an app like Textio that helps writing highly converting emails (and other stuff), you’ll definitely make your life a lot easier! Since you can’t really read their minds, the next best thing is using Crystal. By analyzing candidate profiles (social, emails received, etc. ), the software gives you a solid idea of what their personality is like. It can even give you suggestions on how to write better emails, as per the candidate’s taste. Think, if they’re pragmatic, they’d probably want to hear the exact date of the meeting rather than “one of these days.” And as every salesman knows, you can close every lead as long as you have the right approach. Crystal gives you insight into one’s personality based on his/her online behavior. Any tools that didn’t fit in the previous categories go here. 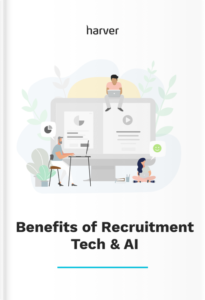 Although not focussed on the needs of recruiters specifically, they’ve got your back have you with all the minor things in your day-to-day office life. As with any job that involves dealing with clients, you have to be professional. Having your grammar corrected by a candidate is definitely not something to be proud of. It’s also quite ironic when you misspell “Attention to details” on a job description. Grammarly scans any text you write & provides guidance on grammar, spelling, and style. Grammarly gets your writing on point! You need to send a potential candidate the paperwork. You get off the desk, head to the printing room, turn on the scanner. The scanner isn’t working properly and messes up the document. You call the IT guy, finally settling the issue and scanning the document 30 minutes later. Or alternatively, you use Scannable by Evernote. It allows you to scan documents straight from your phone, saving you the time and hassle of dealing with printers. Alright, that’s a wrap! Of course, the 11 tools in this list don’t give an exhaustive overview, but if you start using them you’re bound to give your productivity an extra boost!